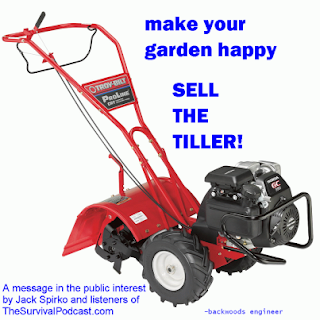 The Backwoods Engineer: Do your garden a favor: Put your tiller on Craigslist! Do your garden a favor: Put your tiller on Craigslist! After my friend Jack Spirko went on an epic rant on the problems with tilling Friday before last, I decided to make a visual message to support the message. Is there any benefit to tilling? No, no, no, no, no! Do not till! Plain and simple, don't do it. ... Can you tell me that tilling prevents weeds from growing in your soil? ... You're compacting your soil, you're making a nice fertile ground for every weed seed, and you're killing everything that's alive in your soil. That's why you seem to get a fertility burst -- you're growing on dead bodies! Tilling does NOT prevent weeds! They come back. And tilling has some real downsides for gardening. Tilling destroys micro-flora (bacteria, fungal hyphae) and micro-fauna (worms, bugs) that keep the soil healthy and form beneficial symbiotic relationships with garden plants. Tilling mixes soil layers that have different pH - which is how plants with different pH requirements can thrive in the same area. It's like going to the smorgasbord and mixing up all the different pots. Not everybody likes the same thing! Tilling also hard-packs lower layers of the soil, making it harder for taproots to go down. Tilling causes more weeds! It's true! By mixing up weed seeds on the surface with the loose soil, they will just come up. Mulch, mulch, mulch. I didn't believe in this until I did it myself. When you lift up that layer of mulch, you see amazing, loamy soil under there! Plants love it! Can you use a tiller to break up hard land to create garden beds the first time? You can, but there are better ways. God, I believe, gives us nature as a teacher. If we will listen, she will show us a better way. We can build soil by using composting and mulching. That soil will be much superior to that created by the tiller. If you still stop killing everything... Take your tiller, and put it on Craigslist! No more tiller! No more tiller! Get rid of the tiller! If you will stop tilling, life will come into your soil, and worms and bugs, and bacteria... your soil will have structure, and you will have life. The soil will till itself, as Nature intended. Nothing in nature emulates a roto-tiller. Not even a pig. ... That's why every time we till, we get problems. Every time we till, we compact the soil. Every time we till, we get more weeds. That brings up another issue. A lot of weeds are considered that precisely because they thrive (although usually they qualify as being invasive or noxious for ones that are illegal to deliberately replant - old established plants [natives] generally legally get a free run). Grass doesn't do too well in Colorado Springs unless you use insane amounts of water. It dies for a reason - it's not meant to be here! Save your yard and wallet - grow pine and aspen trees! To other readers: You should get a soil test and amend appropriately. By taking matter out of the soil, it's inevitable that you'll wear it out. So, if you're on a sewer system and you're eating corn from your garden and worse yet, not composting the humus, you're sucking all the phosphorus out! Another thing that compacts soil is having too much of the wrong kinds of so-called fertilizers added. Poisoned soil = dead soil (no or wrong microbes) = all air and moisture in it dries up = it turns to hard sandy clay. Nothing fixes hard compacted soil like filling it with dead leaves and growing beans or other less-intense plants on it for a few years. Nothing can fix soil that has no nutrients though - plants and bacteria aren't alchemists or nuclear reactors. It's also possible to overuse Triple Phosphate and end up with soil where the phosphorus binds up the metals needed for healthy plants. It's no good if the plants can't absorb it through their roots!